​Monroe County, here we come! Founded in 1820, Monroe County is named after the 5th president of these United States,James Monroe. Monroe was the last president of the original Founding Fathers, and the third of them to die on Independence Day. Monroe and his Vice President Daniel Tompkins were in office from 1817 to 1825. Tompkins is the namesake for Tompkinsville, Monroe County’s seat. 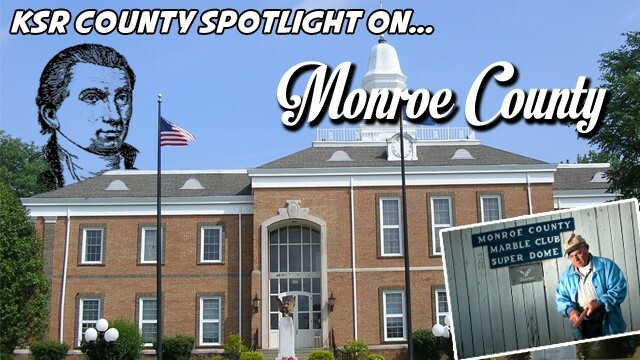 This makes Monroe County the only county of America’s 2,957 to have the county named after a President and the county seat named after his VP. One more quick fact, Tompkins died only 99 days after his vice presidency, the shortest duration of any VP. You can thank me when you nail one of these questions in Final Jeopardy one day. Apparently it was illegal to smile back then, as Daniel Tompkins shows us here. Speaking of, let’s take a look at Tompkinsville. Tompkinsville is one of our smaller county seats, with only around 2,500 people living in its 3.8 square miles. Settled around 1790, Tompkinsville was the site of John Hunt Morgan’s first raid in 1862. As they would eventually be known as Morgan’s Raiders, J.H. Morgan and his posse rolled into Tompkinsville and attacked Major Thomas Jordan’s 9th Calvary, defeating them and capturing 30 prisoners in the process. They also took wagons, horses, mules and supplies before burning down the original courthouse and moving on. They eventually moved north where they fought in Lebanon KY before riding through Springfield, Bardstown and Garnettsville before heading into Indiana. You’re learning so much today! See .. no one was happy. So let’s talk about today. When people talk about Monroe County and Tompkinsville, the word I keep hearing is barbecue. Monroe County is home to no less than 7 separate but delicious barbecue joints, all of which feature their traditional vinegar based barbecue sauce. You can pop over to the small town of Gamaliel and grab some food from JayDee’s BBQ or Collins BBQ. Or you could hang in Tompkinsville and hit one of their four BBQ restaurants. Word on the street (aka my friend Dustin who’s from there) is that if you’re looking for the Tompkinsville staple barbecue joint, you need to hit up France’s on Fourth Street. Make sure you get that shoulder plate, which is pork shoulder either dipped or sprinkled in their delicious vinegar based sauce complete with baked beans and coleslaw. If you’re not in the mood for barbecue, which is weird, then you should try Dovie’s. Dovie’s was founded just before World War II, and has been serving their famous burgers ever since. They even won Kentucky Living Magazine’s Best Hamburger in the Stateback in ’05. If you’re a calorie counter, you may want to keep driving as the Dovie’s burger comes deep-fried with their special sauce. You can also get deep-fried hot dogs, bologna and egg, ham and cheese or ham and egg sandwiches as well. I went looking for some activities and events to help us work off some of this food, and I don’t see that happening. Although, they easily have some of the more interesting eventsI’ve found thus far. We missed May’s Fountain Run BBQ Festival but we can still catch August’s Watermelon Festival on Main Street. This includes a beauty pageant, car show, parade with floats and of course, food. The watermelon seed distance spitting contestis my personal favorite for obvious reasons. But, if that’s not your thing, let’s play marbles. Yes, those marbles. Tompkinsville is home to the Monroe County Marble Super Dome. Here you can play the game of Rolley Hole. In its simplest terms, Rolley Hole is a combination of golf, pool and croquet. Two person teams compete against one another with the intention of moving marbles around a 40′x20′ marble yard and hitting your marbles into three holes in succession. I’ll let my boy, 2012 National Champion Marble Player Paul Davis tell you more about it via this KET video. Start it at the 9:40 mark and enjoy. Seriously, it’s definitely worth the watch! And with that, another county is in the books. I’ll see you on the marble field and remember, if you have questions about the Annual River Race, give Donnie a call. We’ve been on the road for a while and I need to swing by my place and let my dog out. So next on the list, let’s check out Fayette County! Remember, if you want your county’s favorite hole-in-the-wall restaurant, or cool town event featured, hit me up at CoreyKSR@gmail.com and we’ll get it on here!